Recently, Google announced that Chrome’s built-in ad blocker will go live as of February 15th and many Publishers already received notifications from Google requesting that they align their websites with the new rules. In this blog post, we will clarify the situation and explain ExoClick’s solutions to these new regulations. 23rd January: Google will start blocking window.open/new tabs for what it considers Abusive Experiences. 15th February: Google will start enabling adblock on websites that do not meet the Better Ads Standards. The main objective of the Chrome ad blocker is to block ads that are considered intrusive and annoying to users. Google has created two different types of report: the Ad Experience Report and the Abusive Experience Report. What is the Google Ad Experience Report? This report lists any ad experience that could, according to Google, “annoy or mislead”. For now, the report applies to sites with the largest amount of visitors coming from North America and Europe (including Russia). What is the Google Abusive Experience Report? Auto-redirects to a page without user action. Resemble system/site warnings or error messages. Simulate messages, dialog boxes or request notifications. Show features that do not work. Display a “close” button that does anything other than closing the element when clicked. Any clicks outside the content of a site or ad that take the user to a landing page. What are the consequences for Publishers if they violate these new restrictions? Google will send publishers a violation notification, the publisher will have 30 days to stop displaying the ad format(s) and will have to submit their site for re-review via Web Tools for approval from Google. In the case of an Abusive Experience notification: external links (window.open/new tabs) will be blocked. In the case of an Ad Experience notification: ads will be blocked by Chrome’s built-in adblocker. In both cases, users that visit the site with a Chrome browser will not be able to see/click ads and publishers revenues will be impacted. Regarding the Ad Experience Report, the best strategy is to use alternative ad formats for your ad zones that Google accepts such as pre-roll in-stream and native ads; both these formats are available on ExoClick’s platform. Regarding the Abusive Experience Report, avoid submitting your site proactively, you will eventually receive a notification from Google. Once the notification is received we recommend that you apply blocking labels as detailed in the next section. 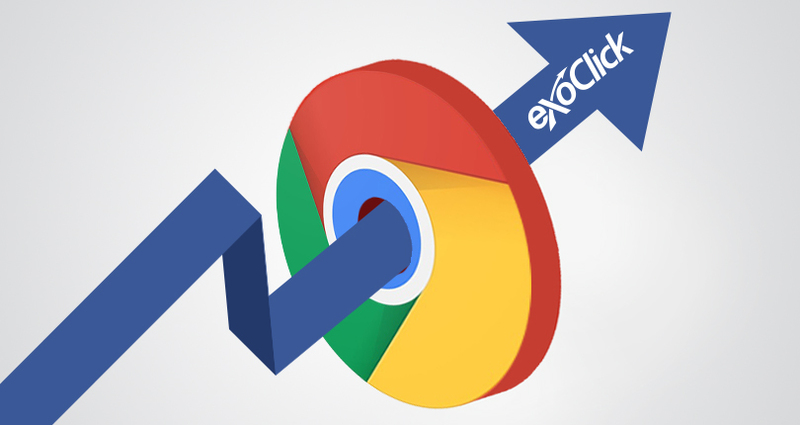 During the last few months ExoClick has been working on features to ensure its network is compliant with the Better Ads Standards, for example, as of September 2017, ExoClick stopped accepting any Flashing Animated Ads in campaigns. Additionally, in the admin panel, ExoClick has created labels that publishers can use in order to block ad creatives considered to be “abusive” by Google. ExoClick has now merged a range of these labels under “Misleading Elements”, enabling publishers to block a range of labels with just one tick to ensure compliance. The purpose of this gives publishers the flexibility to apply these labels in specific GEOs or devices, or across all of their sites. The single label “Misleading Elements” ensures that your are blocking all types of ads that are deemed unacceptable by Google’s Abusive Report. ExoClick has created two additionally labels publishers can block called “Blinking Elements” & “Popunder – Auto-sound” by selecting these along with the “Misleading Elements” label your site will be fully compliant with both the Ad Experience and Abusive Experience Reports. As an ExoClick publisher, we are here to help you, so we have made it easy for you to get in touch with us via our contact form if you have any doubts about Google’s restrictions we have added a new reason for contacting from the drop down menu: “Google Abusive Report”. Feel free to forward any complaint received from Google so we can take immediate action and assist you.